These wonderfully gentle creatures are easy to keep or farm, they are docile, intelligent, very curious ... and cuddly. Farming them is easy on the pasture as they are gentle feeders and their feet, cushioned pads, cause minimal damage even to wet pasture. Generally, they use 'middens' (dung piles in fixed places) which makes for easy clean up. Health-wise this makes the alpaca less susceptible to parasites and diseases as most of the pasture remains clear of droppings contamination. Because of their ancestry high in the mountains of South America they are very hardy animals that will stand cold, wet winters as well as hot, dry summers. Cover for alpacas is not a requirement; although we do have shelters available, they are rarely used by our alpacas. They are very efficient feeders, too, getting better nourishment out of a range of different pasture types than sheep would. The main issue with alpaca, in both a business and pleasure sense, is the slow pace of breeding. Although the birthing very rarely requires any intervention, and nearly always takes place during the day, you do have to wait 11½ months after mating for the cria, a baby alpaca, to arrive!. They are natural mothers and usually do not need any additional care from us humans. The cria is usually walking within two hours, and feeding from his mum within three. Finally, the alpaca has a significant future. 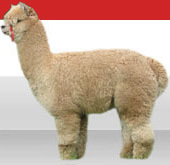 Today alpaca owners have the opportunity to take a variety of strategies towards their alpaca - colour, fleece type, fleece fineness, genetic line, temperament, confirmation - an unlimited choice and plenty of space for any new or established breeder. And that future is imbedded in the ease of management of these wonderful animals, and in the ease of learning for all breeders about how to get the best from their herd, large or small. However, the vacuum today for the whole industry is the natural issue of the slow breeding cycle of the alpaca; this is the primary reason the branding of 'New Zealand alpaca fibre' - see the crimpy bundles of fleece lower picture right - is so difficult because we cannot yet deliver commercial quantities of alpaca fibre. But I hope you see this as an opportunity to get in early to this industry, to enjoy these wonderful animals, and to enjoy the industry as it ... very naturally and very slowly ... develops! Click Here for more information about Wonderful Alpacas...	on the Alpaca Association of New Zealand website.